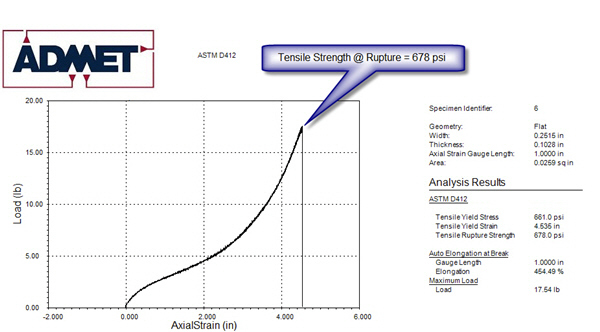 ASTM D412 (D 412) covers the tensile properties of thermoset rubbers and thermoplastic elastomers. The specification describes two test methods, A and B. Method A is common and can be performed on a universal testing machine (tensile testing machine). If you are going to perform this test, you should read the entire specification from ASTM. This is a quick summary to decide if this test is right for you and to point out what equipment you need to perform the test. 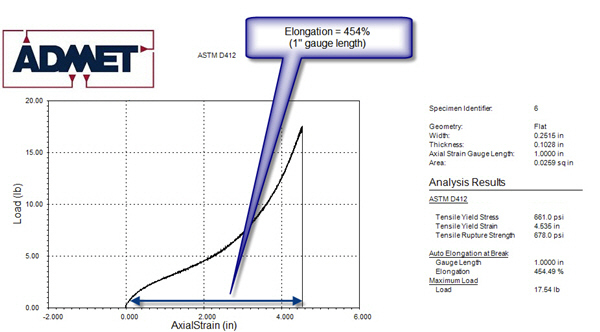 There is a wide variety of equipment that can perform the ASTM D412 test. The first video shows a typical system that is easy to use and has no comprimises. The second video shows a more simple setup that is commonly used by customers with less demanding requirements or perhaps budget limitations. The normal price range for a single column D412 system can range from $ 8,000 to $ 20,000 USD. We’ll help you configure a system to your needs and budget. 1. Cut or injection mold your material into a “dumbbell” shaped specimen. 2. Load the specimen into tensile grips. All of our eXpert 2600 series dual column machines meet these requirements, and it is also common to use our single column eXpert 7601 XL with 53 inches of crosshead travel. 2. An extensometer is optional but recommended. We recommend one for two reasons. First, dumbbell specimens do not have uniform widths which cause errors when both the wide and narrow sections of the dumbbell shaped specimen elongate at different rates. Secondly, elongation is usually an important design characteristic of rubbers and elastomers so an extensometer can be used to improve accuracy of the measurement. 3. Software or suitable electronics are required to operate the machine and to take the measurements. Basic systems will provide the raw data, and stress-strain charts. Using these sources of data, you can determine and calculate all of the analysis listed above. However, fully PC based systems have the capability to calculate all of these automatically. For example, our MTESTQuattro testing software has built in support for ASTM D412 and all of these calculations are provided immediately after performing the test. pulled apart. Elastomers pose a challenge to hold because they thin as they are stretchd. Therefore, the vast majority of elastomers need to be held with self tightening grips. Examples of these grips are eccentric roller grips, wedge grips, or pneumatic grips. Regardless of the grip design, the concept is the same – they tighten on the material as it thins to keep constant force on the sample. Have a question about ASTM D412 testing?